Rory is swinging about 120 mph through the ball on his drives. So to “stick his finish” every time Rory has to be good at slowing down. And if you want to hit longer drives you must learn to do that as well. Because you can only swing as fast as your body will safely let you slow down. Your mind knows your bodies limitations, and it will only let you swing as fast as you can slow down, because if you don’t you’ll get injured. Here’s an analogy so you get this. Imagine having a super car that can go 300 mph but it has terrible brakes. If you get behind the wheel and you know the car has terrible brakes, then you’re not going to go fast because you know you won’t be able to stop and you could die, or spend the rest of your life as a vegetable, or…. you get the picture. It’s the same thing with your swing. Your mind won’t let you swing fast if it knows you can’t slow down. But don’t get me wrong here. I don’t want you to think you need to practice slowly to teach your body how to slow down. You don’t want to do slow movements if you want to swing fast. If you want to swing fast (and you should because then the ball will go further) you need to move fast. So instead of moving slow you need to teach your body how stop while moving at speed. 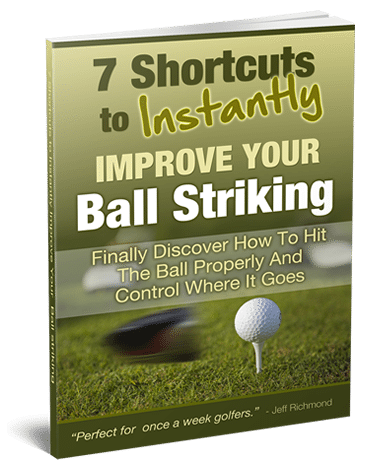 By doing this you’ll train your body how to slow down after doing a fast movement like a golfswing, and it will mean your mind will allow you to swing faster through the ball. Below are some things I’ve been experimenting with to help myself learn to slow down. These are not my recommendations for you because I don’t know your physical capabilities. I’m just letting you know some things I’m doing and then you can experiment with them or other things like them, to help train your body to slow down after a fast swing. If you have some things you already do that are not on this list I would love to hear them so I can try them out. Just reply to this email and let me know what they are. Anyway, here’s what I have been experimenting with…. 1. The first thing I have been doing is easy. All I’m doing is a 20 yard sprint but at the end of the sprint I stop as fast as I can and run backwards. If you do this then you have to do it based on your own body. You might not be able to sprint but you can do the same exercise with fast walking. Fast walk for 10 yards then stop quickly and walk backwards 10 yards. Then forwards 10 yards, then backwards 10 yards. For any of these exercises you have to do them within your own current physical limits. 2. For this exercise I simply swing a golf club without a golf ball. But half way into the follow-through I reverse the swing so I swing back through where a ball would have been. I started out slow doing this to get used to the movement, because it’s a lot different to just swinging through to a complete finish. And if you try this I suggest you start out with about 50% speed swings. Then as you get used to that, gradually speed up until you can do full speed swings. 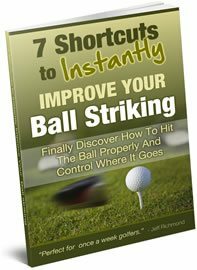 I have found this to be a great exercise because it really does teach your body how to stop quickly at the end of a full, fast swing. 3. Next I got out a medicine ball and setup in a normal golf posture while holding the medicine ball quite close to the chest. Then I turn as though I’m making a backswing and then turn through into the follow-through. Half-way into the follow through I reverse what I’m doing and throw the ball the opposite direction to the follow-through. 4. For the next exercise I got two light dumbbells and got in my golf posture. Then I turn to the right like I would in the backswing and punch with my left arm away from the target. Then I bring the arm back and turn to the left like I would in the follow-through and punch with the right arm. Then I bring the right arm back and turn back to the start. By doing this it teaches the body how to slow down at the end range of motion, which is what your follow-through is. I do about 10-20 reps with this exercise. 5. Finally, I do one legged sideways hops. For this exercise I simply hop sideways back and forth from one leg to the other. You can make this as dynamic or as slow as you like. But it’s a good exercise to teach your body to go from a movement to a stationary position, then to a movement the other way. So there you go, that’s 5 exercises that I have been doing to help myself learn to slow down after a fast swing. Remember, you can only swing as fast as you can slow down. And remember, what I’ve given you are examples of what I’ve been doing. Do your own experimentation with different things to train your body to learn how to slow down better. I’d love to hear what you try and if it helps. And finally, one last thing. Rory McIlroy holds the finish of his golf swing for 2-3 seconds, and that’s a good habit to get into as well. Practice swinging through to a good finish and when you can do this consistently you’ll hit better shots as well. Very rarely have I seen a bad golf shot after someone has posed a great finish. Some food for thought to finish.